Ty Louis Campbell - our little fighter: My "Big Kid"
When I found out I was pregnant for the first time, I signed up at babycenter.com. I wanted to track everything about my baby's growth from the time he or she was the size of a sesame seed until birth and beyond. Every week I would get an email about how my baby was growing eyelashes and was the size of a kumquat or something. It was so exciting. After Ty was born - the best day of my life - I continued to get these emails. The subject line always read "your baby this week" and would be filled with information on developmental milestones, parenting tips, etc. As he got older, the subject changed to read "your toddler this week," then "your preschooler this week." I noticed that since Ty turned five, it now reads "your big kid this week." How is it that my little baby is all of a sudden a big kid? My tiny, toddling two-year old who we took to the hospital for some peace of mind one night, ended up becoming such a big boy during all of these subsequent hospital stays. He grew up in so many ways that I never wanted for him, but still he smiles and shows us all that he is the same "kid" we know and love despite all he has been through. I can't remember the last time actually I read one of these emails from Babycenter. Certainly well before Ty was even diagnosed because once Gavin was born I barely had time to comb my hair in the morning :) Then, of course, once he had cancer I didn't live in that world anymore where teaching Ty how to cope with sharing was something I was concerned about. When I noticed the most recent email, I debated on whether or not I should just unsubscribe. I don't know, should I? I guess there are going to be a million things like this that I am going to have to decide about. Whether or not it's better for me to let go of them, or hold onto these hurtful but special reminders of my son. Ty Louis Campbell. Who was here, who was five years old, and who was so very important to so very many people. Today's sleepy smile of the day (above) was a really big one, but we could only capture the tail-end of the moment. Ty slept most of the day away today, probably because he was running a low-grade fever at times. He was only awake for a total of about four to five hours all day, three of which were between 5 and 8PM. That was when the magic happened. It was just Lou, Ty and me. He was talking to us in a whisper and he joked that he wanted to stay up and "party alllll night." That used to be one of his favorite things to say, and we haven't heard it in so long. He gave us the biggest sh*t-eating grin over that joke tonight. We loved it and it took away a lot of the terrible anxiety that had otherwise been sitting on my shoulders and crushing my chest all day. I wish I had a better update for you from a medical perspective, but Ty continues to suffer from nausea and most recently we found that his skin is deteriorating. He is essentially developing pressure sores on his ears because he is laying on his side all day and night, then the skin over the valve of his VP shunt developed a huge scab overnight! This is a very big deal. 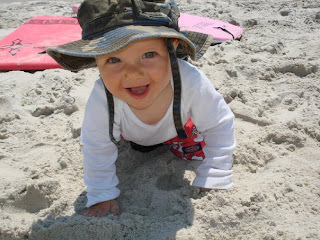 As you might recall, Ty's last surgery was necessary to address some stitches over his shunt that weren't healing well. 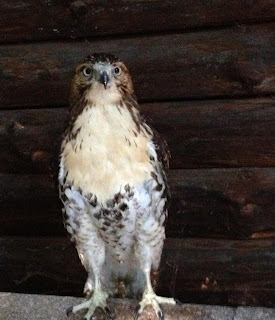 The hardware had to be replaced and moved to an area on his head where the skin was healthier. Unfortunately, it protrudes from his head quite a bit so when he became bed-ridden the skin in that area became irritated, too. Now he can only lay on one side, and if that sore gets worse he will be at a huge risk for another infection in the central nervous system because the hardware will be exposed to the elements. This is the photo we shared with his doctors (sorry if it's hard to look at, but this is the reality of my five-year-old's life with cancer). 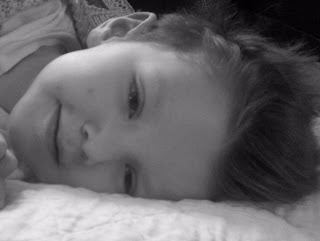 Surgery isn't an option, at least not one that we would consider knowing what we know about Ty's progression of disease. Instead, his nurse created a foam pillow with a hole cut out for his shunt and his ear in case he needs to turn to the other side. He has been on antibiotics to hopefully prevent the spread of infection. We will be watching this closely and praying it heals. Ty needs to be comfortable and this is just another thing that will hinder that for him. I want to scream about the unfairness of it all. If I ever meet the "Murphy" behind "Murphy's Law", I will make sure he is utterly tortured - because anything that can go wrong, has. I will also laugh in his face as I'm crushing it under my boot because Ty continues to persevere through it all. Ty Campbell is the strongest person I will ever know. His name alone oozes the strength, dignity and dexterity of a Quarterback or Surfer, a CEO or Senator. Even better, a little boy whose bravery changed the lives of complete strangers forever. I have so much more to share about today because there were some wonderful events taking place in honor of Ty this weekend. I hope I can do them justice because I wasn't able to attend most of them, but Lou and I took turns bringing Gavin as much as possible. First, the homecoming parade in Pawling honored Ty with a superhero theme. I marched in the parade with Gavin for about five minutes before he was too overwhelmed (and cold!) 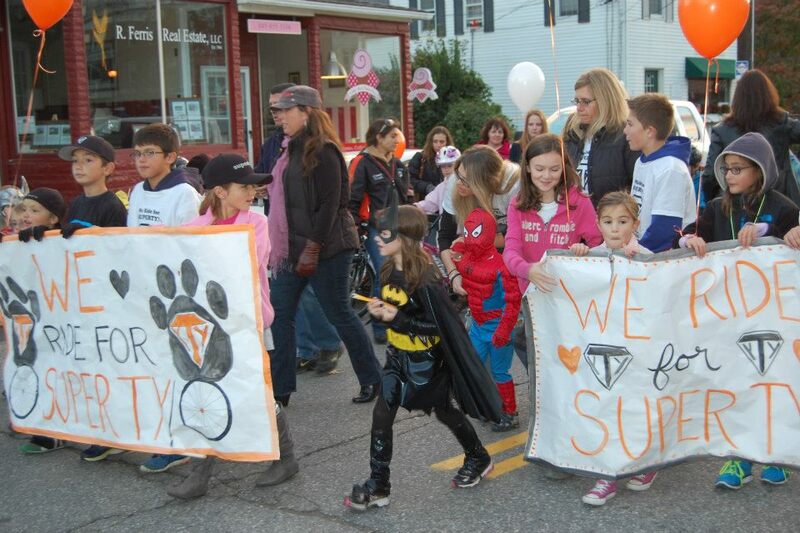 but it was so great to see all of the kids and Pawling families supporting SuperTy! That's me and Gavin in the middle, but it's hard to recognize him dressed in full Spiderman gear. Gavin has recently traded in his Toy Story obsession to share in Ty's love for super heroes. The Rock n' Roll 10K took place this morning, as well, and Team SuperTy raised tens of thousands of dollars for the Weill Cornell Children's Brain Tumor project. Some of my best girlfriends in the whole world, who I've known my entire life, flew in from California, Florida and Virginia just to run. They even drove several hours back and forth from Long Island just to see Ty and spend a little time with me last night. It was so special for me to hug them and cry with them and just remember what it's like to be surrounded by my closest friends. So much time goes by and we are so busy with our lives, but when we get together it's like nothing has changed. I love them all so much. 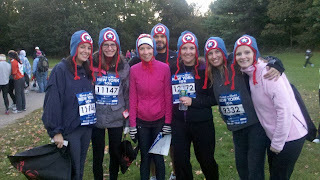 And, I am SO PROUD of them, and all of the amazing people who ran for SuperTy today. A 10K is a big deal, and they were running like the wind!! Thank you, everyone. There are so many runners on Ty's team who I have yet to meet and I was so disappointed I couldn't be there to hug each of you and give you my most sincere thanks. I don't have a team photo yet, but I will post it to Ty's facebook as soon as I can! Here are some of my favorite people in their Captain America hats. I'm not the only one who will be wearing that hat all winter for Ty :) Awesomeness. Speaking of the hats, there is an auction that is still underway until September 17 (thank you so much to the beautiful person who coordinated this). CLICK HERE to check it out (I believe you need a facebook account). In Lou's hometown, a rehabilitated hawk was re-released into the wild in Ty's honor. 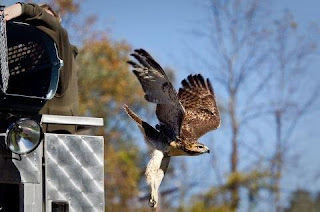 Approximately 100 people were in attendance today and it was a beautiful sendoff for the hawk named TLC (aptly named to represent the tender loving care that saved her life, and Ty's initials, the little boy who inspired the event). It took so much work to pull this event together in such a short time, and I can't believe how amazing it was. Lou was there with Papa and Gavin, and the photos are priceless. 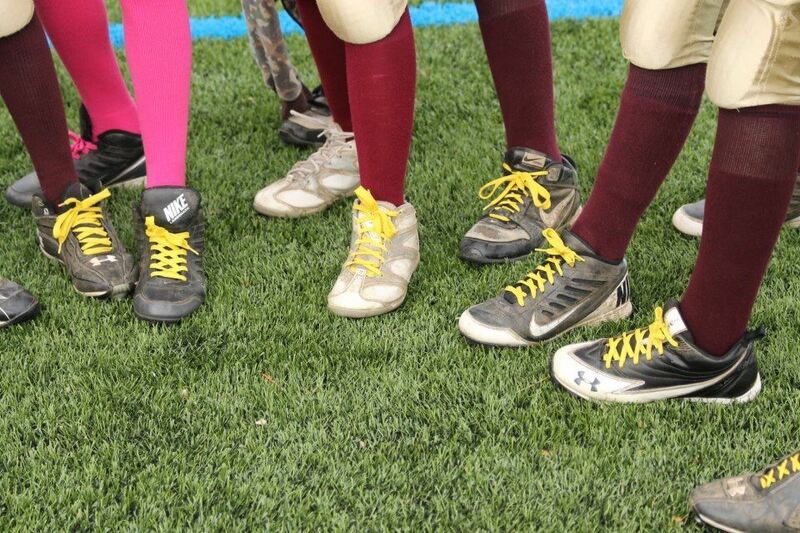 This weekend, our friends also started an online petition to get the NFL & Nike to go gold next Sept. for pediatric cancer awareness. I believe you can easily access this online and participate here by filling out a simple form. In addition, the Ty Louis Campbell Foundation was approved by huge corporation, Pepsi Co. to be on their matching gifts website & will match any donation made by a Pepsi employee. A 3-mile race took place in Yorktown in honor of Ty (please send me pictures via facebook, I don't think I've seen any!) and two online shopping fundraisers with Silpada Jewlery & 31 Bags are taking place where profits will be donated to the Ty Louis Campbell Foundation. A friend in Massachussets has even taken it upon herself to create "I Love Kids" bracelets with SuperTy symbols and sell them locally for the cause. What I love the most is how many kids are getting involved in the cause. I wish Ty could understand how truly loved he is (I think he knows, actually). We've received so many cards and posters from kids and teenagers since Ty's birthday, and every one of them are on display in our living room so Ty can see. The local Carmel cheerleaders changed their hair ribbons to gold in honor of Ty & to raise childhood cancer awareness, and the HVK junior pee wee football team is wearing gold shoelaces. They aren't waiting for September next year, they are doing it now and I was so honored to know that Ty influenced this. For you Ty !! My son Nicky broke the huddle down tonight yelling, "remember who we're playing for 1-2-3 Ty !" And they won big for ya buddy 33-13!! The weekend has been a very busy one, so please don't worry if I don't get a chance to post as regularly or respond to your messages. I haven't had much time to get online, but I will catch up sometime this week :) As always, know that we are so thankful for your comments, your encouragement, your guidance and your prayers. What amazing things being done for an amazing little boy... I mean big kid! That smile is just wonderful. I hope Ty feels comfortable and knows people all over the place are praying for him and thinking of him! My boys and I wished you well again tonight Campbell family. We will do so every night for as long as it takes. My own 5yr old asks for updates every night. I hope more than anything that I will one day have wonderful news for him. Big hugs from NC. Your family makes the world a better place, thank you! What an incredible day! So many ways to express love for Ty, and your family.. This is the type of day that you always remember. Thank you for sharing it with us. It breaks my heart again and again that not only he has cancer but that that he is so uncomfortable. Please dear powerful G-D give him a break. Cindy I rewatched your video about Ty from the recent article few times today and if I cried before it was nothing like I cried today. The way you picked him up his breathing his hands everything about him just broke my heart he is just so precious but so fragile and you and Lou are the best parents in the world. I registered to an organization to volunteer with pediatric oncology mostly at people home to become like a big "sister" and all in the name of Ty. Everything I do I think of him and I hope and pray that its not too late to find a cure and make Ty healthy because nothing in this world would mean more than this. I am so happy about the color gold and the bracelets I would love to buy it and the hat of course and I'm also trying to make superty thirst for me and my boys who simply adore him. I made them watch a video of Ty today and I want them to learn whats important in life and how precious life is. Please remain strong. Love you Ty to eternity. It is truly inspirational how you are handling this devastating time in your little angels life. You and your beautiful family have opened our eyes to the ups and the downs of living with cancer and I wish I could offer my hand to hold yours whenever you'd need it, he is just such a beautiful, precious little guy and melts my heart to see his gorgeous little face smiling in the face of adversity. All we can do is pray, we have certainly started doing that for you - much love. What a great smile! Stay strong Super Ty and soar like that hawk! High above cancer and it's wretchedness. You are so loved by so many who have never met you. Prayers and so many hugs and kisses to a beautiful boy! Prayers and love to Gavin, Cindy, and Lou. God bless you SuperTy! Please God grant him a miracle and lay your healing hands upon him. Such beautiful events to honor you precious Ty! He is truly amazing with his sense of humor despite all of his pain. What an inspiration to all of us. In addition to the miracle we are all waiting for, I will pray for quick healing of his head wound and ear. And his nausea. I feel so crushed by all of his discomfort. You and Lou are so amazing. Thank you for sharing the love(s) of your life with us. Ty is like TLC, strong and beautiful! The love you have for him is amazing and so special! Praying for you all! We are praying in Nebraska for all of you!! God Bless! I sat tonight watching my two boys messing around the living room and all I could think of was Ty. Thank you for reminding me about what is truly important in life...our families. I am not going to let petty thoughts and meaningless issues bother me anymore. I just want to always count my blessings and be appreciative of what I have. 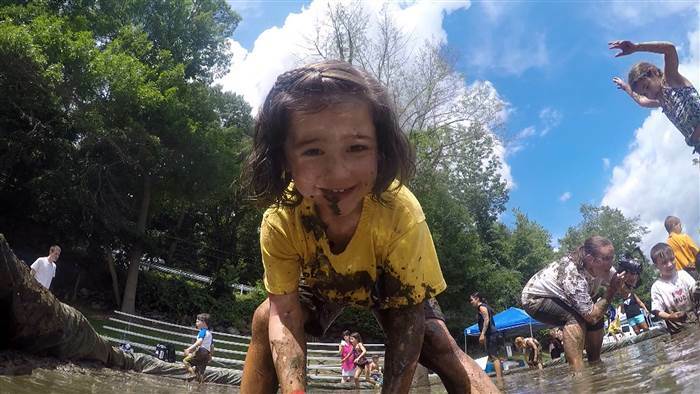 I am going to support pediatric cancer research like never before, because these precious children deserve a chance to live a fun,muddy puddles life. God Bless all of you. I'm so glad you got some time with your girlfriends, there is nothing like it. Whew! Thanks for posting. When you don't update nightly, I get nervous about my little super hero. Ty: I hope you had fun partying "all night." I love you so much. I love all the events that have been made in Ty's honor and how his story is spreading. I pray his shunt and his ear heal soon. Thank you for taking the time to keep us posted on Ty. I know we all hope nothing more than for Ty to have good days and nights but much more for God to heal him. I wish Ty a good night and may God bless him and your family as well. How beautiful to see so many events to honor such a deserving boy! Love to see how every one rallies for him. Have you asked his nurse about tea tree oil? It's a natural antiseptic and promotes healing, maybe it can help? Sending buckets of love and support your way. Have been reading for some time, but haven't commented....want you to know that we are sending all the love and comfort we can from here. To you, and to beautiful Ty. So sorry to see the sores on the little guys ears and head. Can you ask the nurse about colloidal silver creme. It is a natural antibiotic. I was in bed and felt compelled to pray for you a little after 1 Am. I dont know if I ever prayed so hard.. it actually hurt my head! I felt like a nut writing at this time of night. I see though, that I am not alone. You and TY have changed so many lives. That in itself is a miracle. May you rest tonight Cindy and Lou, and be lifted up in the presence of the Lord. You are surrounded by his loves and prayers of thousands. What incredible events today to honor that incredible little boy! I also saw the article posted on your Facebook! National News! Well, I must say, it is about time!!! I filled out the petition and will be sharing it with everyone! Thinking and praying always! Today is My Birthday..the Big 50 Candle's to Blow Out..Each candle, I blew out, was @ IS for Ty's Healing, for you,Lou and he's lil brother..If I could take all of my B-day wishe's @ put them in a jar( A BIG Jar), I'd give the jar to God... Please Heal Ty Louis Campbell..
Cindy, Have you considered a sheepskin for Ty to rest any pressure areas? You are so busy and so loved! It's 11:30 pm here in California, and I'm wondering if Ty has you partying all night long at 2:30 am - what a sweet boy still so full of mischief! I just love it..and him...and all of you. I sent you a message on facebook asking for your address because I would like to send something for Ty! Would love you answer it soon as it will take some time to have it shipped from Germany! I love all the events that took place, these are such wonderful gestures! Just found your site from a link on Ronan's site. Praying daily for your sweet little Ty. It is so great to see everyone coming together for Ty - I wish all this love and hope was possible to bottle in a pill and make Ty all better. Thinking of you guys always and wishing for a miracle. Keep strong lil Ty - wait, I mean Big Boy Ty!! You are my hero. The whole Campbell family are my heroes. just know that your little boy is loved half way across the world in Hungary too! He has the best mommy ever! Both of you are amazing so it's only natural that Ty would be too! The only thing that I am thankful for in the midst of this horror is that Ty is too young to fully comprehend the gravity and tragedy of it all. That burden rests on your shoulders and your are doing the most amazing job!!! I will go to church today and pray for you all. Dear Cindy what a wonderful little boy you have in Ty, you must be so proud. My heart breaks for you all. I hope you find comfort in all of this. I can't stop thinking about Ty and your family. Thank you for sharing your angel with all of us. You've reached all corners of the globe with Ty's story and made us all more aware of cancer. It hurts so much to hear about Ty's pain and discomfort but it has also given me some resolve to contribute to this cause and I will be looking at what I can do from where I am. Thank you to you and Ty for reminding me what's really important about life and being alive. When a little superhero can fight so hard for each day then what else is there that can't be done by the rest of us. Kisses and hugs, Judy. This is just amazing. You guys are so strong, and YOU CAN DO THIS!!! GO TY GO!! Where can i buy the captain america hat? I would love one! Stay strong... we are all praying hard for ya. My continued thoughts & prayers are with you & your family. I have been deeply touched by your courageous & heartbreaking journey. You are my hero & will always have a very special place in my heart. I have made a special commitment to be an advocate & an active voice for increased funding for & awareness of children's cancer research. Try using one of the pillowy supports used in car seats for little guys. This may take the pressure off his ears and make him more comfy. My heart goes out to all of you. I will join countless others today and stand in place of Ty at Gods alter asking for a miracle healing. Lord keep your hands and embrace upon SuperTy and this family. God Bless you all. It's great to see there are so many people out there fighting for Ty and supporting pediatric cancer awareness!! Yes, things are starting to happen and God is not finished yet. And we know that all things work together for good to them that love God, to them who are the called according to His purpose. I am always praying for Ty and hoping for a miracle! I only recently heard of what you have been going through and it has captivated my heart. Thank you for sharing everything you have been going through, you are all amazingly strong. I must admit, I haven't turned to God in many years, but in the past few days I have prayed for you all more than I ever thought possible to pray. I will be thinking of and praying for your adorable son Ty. My hearts breaks every time I read your blog, I never have dry eyes when I finish. I am the same as Jessica, hugging my 5 year old son a little tighter and longer every day. Thank you for sharing your story of the bravest,cutest boy in the whole wide world. Many hugs from Australia. Rachel xox. Cindy I have been following Ty's story for over a month and have fallen in love with him and your family. He is a remarkable little/big boy and he has an equally remarkable mother. I pray for him and your family everyday. If anyone deserves a miracle it's Ty! Sending you love from your old home, Long Beach. Someone sent he a pencil sketch of Ronan, and to her he looked 5 years old in the drawing. She was so grateful because she often wondered what he would look like at 5, 6, 7 and so on. I think this website will serve a purpose if Ty has to leave you, and down the road you are longing for that connection of "what would he be like?" I think it will be a comfortable place where you could go and be alone with Ty's spirit. Silly? Maybe. But I would cross that bridge into feeling silly when and if the time comes. For now I would leave every door open where you may possibly find solace should the day arrive when you need it to be there. Last night, we dedicated our marching band show for Ty. Jackie and us Guard girls cried over Ty in the end, because we felt the same pain she felt. When Jackie mentioned Ty, we all thought about him. When we got off, we claimed to have one of the "best shows" so far. I pray for you guys every night, and I hope no matter what, Ty's pain is released in the end. My thoughts are always with you guys <3 I can't imagine living like this. Yeah that picture of the side of Ty's head could be kind of hard to look at. Good. Because that is the unfortunate reality of what you guys are living with, and I think the truth, no matter how it may look, needs to be out there, especially for people like me who have been blessed enough to have never been so starkly confronted by it. Having seen even that little snippet, how could somebody not say that we need to end this horrible disease as soon as possible? My thoughts and prayers are with you all. Just started reading your story after seeing the Poughkeepsie Journal piece. SuperTy is an amazing "big boy" and we should all feel proud to be able to be on this earth with him. I am astounded by your perseverance and grace in the face of all that is happening to you and your family. You are all amazing and deserve the biggest miracle that has ever existed! Love and hugs to all of you! Finally!!!!!! We will see GOLD next Sept in the NFL. I have been yelling at the TV every Sunday so far this month - what about GOLD????? My kids bought gold socks to wear for their upcoming lacrosse tournaments- pics will be coming!!! We are spreading the color & the word!!! Love you SpiderMan!! Campbell's you make this world a better place! 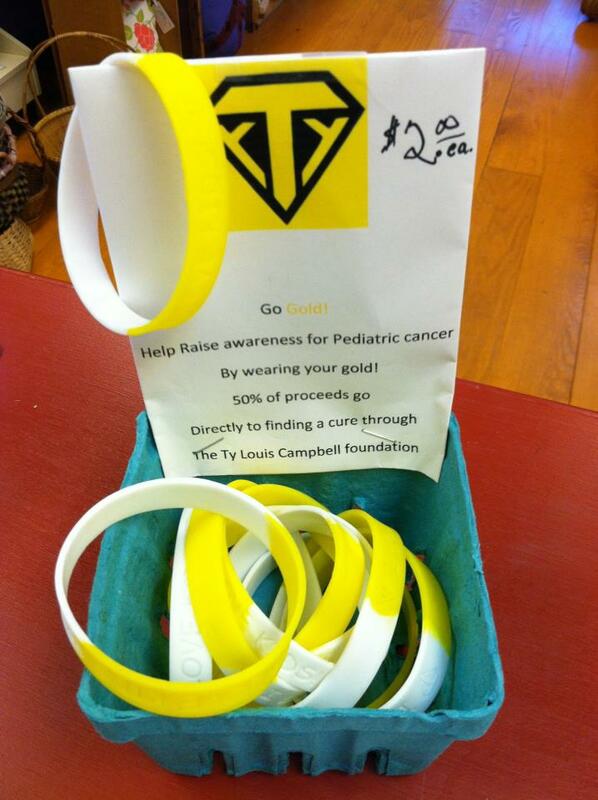 It is always hopeful to see people's support in raising awareness about pediatric cancer through Ty's story. Although I wish it hadn't happen to him -- to any child, it is hopeful to see that people care. I saw that other news outlets picked up on Ty's story. It is wonderful. He is definitively making change. Still praying for a miracle. My heart breaks when you report ANY deterioration in Ty's condition. We're all praying so much for that healing miracle, that it's like a punch in the gut any time we hear that we are not getting the answer we want. But I am SO happy that SO many people are doing so much to raise money and awareness - and all because of your amazing boy!!! My God, the impact this sweet soul has had on this world. It's truly stunning and inspiring. I am currently brainstorming all different ways to make next September unforgettable as Pediatric Cancer Awareness month. I've never been an event planner, or very good at coordinating this sort of thing, so I figure giving myself til September is a good idea so I have plenty of time to get things going. My idea is to have a giant MUDFEST in honor of Ty (and Gavin!) I envision a massive mudpit for kids to jump and play in! Games, food, music, fun! I'm planning on doing this locally (Forked River, NJ), but I thought I'd post my idea here, so maybe others might want to start planning similar events in their areas :) Our town recently lost a little girl, Anna Kopack, to cancer, and the community is just heartbroken over it... so our "fest", will also be in honor of her, and of course, in honor of all the brave warriors out there battling this evil disease. I am so glad that all of these events and efforts are bringing you comfort. I wish a peaceful, happy day for you, and for Ty to have a happy, pain-free day. Hi Cindy, My two kids, 10 and 6, wanted to do some very messy stamping and took out all the supplies for about 10 other art projects all in the hour before my son has to be taken to soccer. It took up the whole kitchen table!!! I thought about asking them to only take one thing out at a time, and then I thought about Ty. Right now, they are stamping away in every different color, making a colossal mess in honor of Ty. Thank you for helping me to pause, and focus on what really matters. Can't stop thinking about you guys...you are all in my prayers and thoughts. Your openess and honesty allow people to truly love your family, deep agape love, which at times is painful, because we allow ourselves to feel deeply; it teaches us a perspective on life, to live in the moment, and to let tomorrow worry about itself. I read Ty's story in the Journal News on Saturday, and I couldn't stop thinking about him and your family. Pediatric Cancer is such a horrible disease, and I'm so sorry that Ty is going through this. When I finished reading your story, I gave thanks to God for all that I have and then I went and lit a candle for little Ty. I asked God to bless him and your family and to continue to give you strength to face each day. You are in my prayers. God Bless and keep you strong! I've been following your blog for about a week now. I heard about SuperTy after reading Maya Thompson's blog about Ronan. You are so strong and full of courage and hope, and Ty has captured a piece of my heart. What a sweet boy. I'm praying for you and your family. People like you and Maya are giving a real picture of childhood cancer, and while I wish with all of my heart and soul that no child would ever have to suffer through anything close to what Ty and Ronan went through,they are giving a reality check of what fighting childhood cancer really looks like. Ty and Ronan are going to change the world! One word, one person, one heart at a time! I have been reading for a while now and it breaks my heart to see what Ty is going through; it just makes you want to reach out to him and take away the pain and suffering; to let him live a full life. I have 2 beautiful girls and it makes me appreciate how lucky i am every day knowing what Ty goes through. Hang in there mate; you are my Super Hero! I can't stop thinking about your beautiful little boy Ty and your wonderful family. Ty is so amazing, strong & SUPER. I am praying for Ty and want him to feel nothing but love. I just bought a SuperTy hat and wish I can do more for Ty. He is truly amazing. Ty has become a part of my daily thoughts, my daily reminder to TAKE THE TIME for my kids, and me and my sons daily prayers. I get so angry reading your updates because your pain, Lou's pain, Ty's pain.. your entire family.. is just NOT FAIR! I don't get it. The other night my son told me that he wants to 'talk to his dad in heaven'. Jacks dad passed a few days before Jack's 2nd bday. He was a great man with a HUGE heart. HE LOVED KIDS! He was almost done with getting his degree so that he can teach Phys Ed and Health to children. He also just finished a few months before he passed running a huge St. Baldricks campaign and shaving his head for pediatric cancer. I told Jack 'You can talk to him.. he will listen always. You were his best buddy, his favorite person in the whole world!". So we are going to pray to Jack's dad, Eddie, for a miracle for Ty. We are also going to ask Eddie that if there does come a time, that God must take Ty, to make Ty his new BEST BUDDY up there. 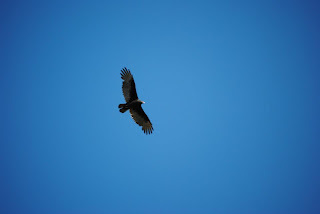 To take him under his huge wing! (He was 6' 5") To Hug him every day like he did Jack. I know Eddie will have no problem doing that for Jack....and for Ty. Where can I purchase a bracelet ?? I very much want one !! I have one in honor of #livefortay .. I need one for little Ty now !! There are not enough words to express how so very sorry and sad I am for you, Lou, your family and for beautiful Ty. No child should have to deal with cancer! It is not right. I would like to print a picture of Ty-I will keep it on my dresser forever so that I will never forget what an amazing little boy he is and how brave he is! I will live my life and be the best mommy I can be in honor of him always! God bless you so much. I'm finding it so hard to write this message to you, all the words I have typed so far seem completely useless and inadequate for what I really want to say, yet you write so openly and with such brutal honestly and share it with us and I admire you SO much, to do that when your heart must be breaking. I just wanted to thank you for sharing your story to all the people out there in the world, like me, who had no clue, no idea before about what cancer does to children and what a terrible and cruel disease it is. I will never again be in ignorance after reading your words about your darling son Ty and I will always support the people and the fundraising to try and find a cure and to improve the barbaric treatments that children have to go through to try and get better from this terrible disease. I'm an English mum, living in Germany, I had my son later in life, 41 years old. At 39 I was afraid I would never be a mum, then he came along just when I thought it was too late, I hope you don't mind me writing that but I just had to explain, just like Ty is to you, he came along my firstborn, the love of my life and I had never felt love like it, it was amazing and yet terrifying at the same time. That depth of love that you feel for your child, it enters your soul and that's why when I read your words sometimes I feel like my heart will break for you and your family, I can't bear it and yet I must read it. To read it and know what cancer can do and to be aware and to pray for a miracle for Ty and to send you my love, to let you know, Ty has made a mark on this earth, he has reached out to people all over the world and Ty has touched so many peoples' hearts all over the world. I have cried so many times reading your blog and then hugged my son even tighter and prayed that there can be a cure found, that something can change because it HAS to change. Ty and the other children with cancer should never have to go through what they have done, it's SO unfair, terribly and tragically unfair and it should never have to happen like that, never be allowed, how can governments give so much money to war and so little to this horrific disease that can hurt little children! I don't understand it and I will never understand it. I want to shout at someone, why is this allowed to happen to such small, innocent children and where is God, can someone give a reason! I get so angry for all the families, like Maya and Ronan and the only thing that gives me any comfort is thinking that on the other side, when people pass over their 'time' is not the same time as we know it here and so we are all together again over there. It's a parallel place where time is of no importance whatsoever because it doesn't exist and so everyone is with each other. You probably think I'm crazy and maybe I am thinking like that but having the feeling that it's like that, it comforts me. Our time is not their time, so nobody can really be apart from the people they love and Ty will never be apart from you. I am praying for Ty every night and hoping he will get a miracle because he bloody well deserves one after everything he has been through. I'm sorry this 'comment' has turned into an essay, I couldn't sleep thinking about you and your family and had to write and send you my love from across the sea. Your son Ty has the most beautiful face, he is so gorgeous, Gavin too, such a cutie pie, please know that by writing about this, you are spreading the word to previously ignorant people like me and gathering an army of people all over the world who want to fight this evil disease and put our money and time into finding a cure. What a beautiful weekend of Super Ty! He has changed the world and will continue to. This weekend after mass, my 2 children, ages 9 and 6 asked if they could go light a candle for Ty. They have never met him in person, just looked at pictures online and read his story with me and yet they ask about him all the time. He is an angel and has touched the lives of so many. You and your family are remarkable and have such strength. We pray for you and send positive thoughts your way every day. You have created such awareness of pediatric cancer and will help children all over the world. Thank you to you and your family! Love to you all! Fellow devotees of Cindy's blog -- you do not need a Facebook account to purchase/bid on the awesome SuperTy.org Captain America hats. You can go directly to www.charitybids.org and set up an account if you're not on Facebook. Peace to the Campbell family. I just heard about you via a text message about a minute ago. I don't know all the details, but I can tell that you are a godly family and I will pray for you and TY. God bless you! May the Lord give you peace and the ability to deal with every day as it comes. Reading all the responses, I am encouraged that there is such an outpouring of love towards you. I began reading your moving blog only two weeks ago when I saw former classmates from Pawling posting prayers and support. Thank you so much for sharing your experience and your beautiful boy with the world. I pray for him, for Gavin, for your family and for everyone who is battling pediatric cancer. I, like so many others, read your entries as you post them, with hope and with tears and with a deep appreciation of you sharing your feelings, thoughts, joys and unimaginable pain. I am a mother of five children and I am deeply moved by your experience. My children are currently healthy, but I am sure there are many mothers out there, too many mothers and fathers, to whom you've given a voice. God bless you and your family. God gave you a beautiful gift and you are sharing your gift with us. Thank you. Thank you for sharing your beautiful Ty with us. I am at a loss for words over the pain and heartache you feel so intimately. As for the Babycenter emails, I would unsubscribe. I find them to be nice little reminders of things I already know as a parent, but they don't really represent my children. I would save any amount of heartache you can. You will have so many other reminders that are truly important. No need for babycenter emails to make you think of what could have been for your precious Super Ty. Of course I pray multiple times a day for a miraculous healing of Ty. He deserves so much more than the hand he's been dealt, and he has so, so much to offer this world. As so many others, I do not know you but feel so attached to your wonderful family and your gut wrenching struggles. God bless Ty, you, Lou, and Gavin. I have only been reading your blog for a few weeks, but I had been reading Maya's blog about Ronan for quite a while. My best friend lives in AZ and knows Maya and shared her struggle with me a couple years ago. Having two little kids, it broke my heart and I've just found myself checking on her blog from time to time. I saw a post she put on there from you and noticed that you were from Pawling. I am originally from Poughkeepsie, so not too far from your part of the world. Anyway, my Mom is battling cancer and we almost lost her 3 years ago. By some grace of God we didn't, and she has gotten to see me give birth to her granddaughter. At one point they told me that she had a 40% chance of surviving without having an invasive, risky procedure, but 0% chance without it. Quite unexpectedly, she had fallen really sick really fast and was on life support when the broke this news to me. I was her medical 'person', so I had to make the choice. What choice really....0% vs 40%....anyway, I don't know how other than divine intervention, but she survived. She is in her 60's, but it was still horrible. She was 'unreachable' for a time, on life support, and not herself for months after. She still struggles with things. The cancer is back, and the fight is on again. We've been doing this since 2005. However, I cannot even try to touch the experience you and Ty are having right now. She is my Mom and I love her, but a child...and Ty. It's just so unfair. He deserves time to live and experience and give to this world. Anyway... I just wanted you to know that there are people here. Out here in cyberspace. Some you may never hear from, but are 'with you'. That care, that check on you, on Ty. That admire your spirit, your positivity. I don't know how the hell you do it. But you are my hero. I find myself praying for you guys every day. Or if my 5 year old or 2 year old are about to drive me over the edge, I think of Ty. And we go jump in the mud or something :-) Life is too short. I commend you for being the person you are. You, as well as Ty, are an inspiration. The fact you can even get on here and catch up on all these posts amazes me. So, just know...there are many of us out here. But in my little part of the world, I pray for you. I pray for Ty. I pray for your futures. And I hug my 5 year old and 2 year old and appreciate ever moment with them. You make me want to be a better mother. Thinking of you and leaving much love, hugs, encouragement and prayers. The Lord is your Healer. for every part of your body. He made you and He knows you. Every hair on your head is numbered. His care for you is perfect and complete. May each day bring new strength, new hope, and a new knowledge of just how deeply you're loved and cared for. I lost my mom 12 years ago to the beast..and truth be told I am still angry at God for taking her away from me. Even though I am mad I still pray EVERY night and ask him to give your family the miracle you deserve...make Ty better. The world deserves the chance to get to know the boy who has affected do many people's lives. Come on God...make a miracle for the Campbell family! Hi Cindy, Lou, Gavin and SuperTy. I just spent the last couple of days reading through this blog. Sometimes it made me smile or laugh. More often it made me weep. Cindy, from your beautifully eloquent and amazingly honest words, I feel like I've gotten to know your whole family and in some small way, I feel like I've shared your ups and downs, your sorrow and joy over the past couple of years. I am not a religious person. I don't know whether I believe in God, or a higher being. But last night I prayed for Ty. I prayed for a miracle cure. I prayed for an end to his suffering. I prayed for you and your family to make it through whatever happens with strength and love. We lit a candle at church for Ty today. Praying every night for Ty and your family. What amazing faith and love your family has. My daughter who is the mother of three, recently shared Ty's story with me. We both pray for you. Little Ty has the best medicine in the world and you can't put it in a bottle. It is the love of his family and their belief in miracles. His journey has had many difficult moments and many beautiful moments. But through his journey mom and dad and Gavin are always by his side. He has the most precious smile. God's love is within you and Ty knows the love you have for him. I have a special lady the Blessed Mother and everyday I pray to her to take care of Ty and his wonderful family. I believe in miracles and pray to the blessed mother daily for one for Ty. God is with you even thou you may feel alone sometimes, he will never leave your side. I have a special little statue I would like to send you, how can I do that? You are truly wonderful parents. Ty and Gavin are both beautiful little guys. You are such an amazing mother! Someone to truly look up upon! Thank you! But those who wait on the Lord shall renew their strength; they shall mount up with wings like eagles, they shall run and not be weary. They shall walk and not be faint. May the Lord watches over Ty and his loving parents, grant them peace and rest so that their strength will be renewed. May the Lord's healing hands be upon Ty, regaining his youth and strength. Amen. I signed the petition and when it required me to type in a "captcha" to recognize those crazy letters that come up.... my letters were H7TY. Hi cindy - I think Ty looks more adorable than the day before!! He is truly becoming a "little man". My prayers and thoughts are with your whole family! You are a truly exceptional mother and you DON'T need any advice from Babycenter! You are the type of mother anyone would strive to be! You have made me a better, more patient mother. and i thank you for that! Thank you for updating us on Ty. Its the first thing i think of in the morning and last thing at night! love you! Praying every day for the Campbell Family Miracle. Your courage is an inspiration to all of us, and Ty's smile a rainbow on our hearts. im so sorry about your loss of beautiful ty. he was an awesome, son, brother, nephew, friend and a lot of other wonderful spectacular things. his life shouldnt have ended so soon. im sure that ty will always be there. Your story is amazing and will truly help so many people. i am so sorry for your loss but you gave Ty the most amazing life and you should be so proud to have had such a strong, handsome and loving little boy. i am so sorry for your loss and i will continue to keep you all in my prayers.